Ace cinematographer K.V. 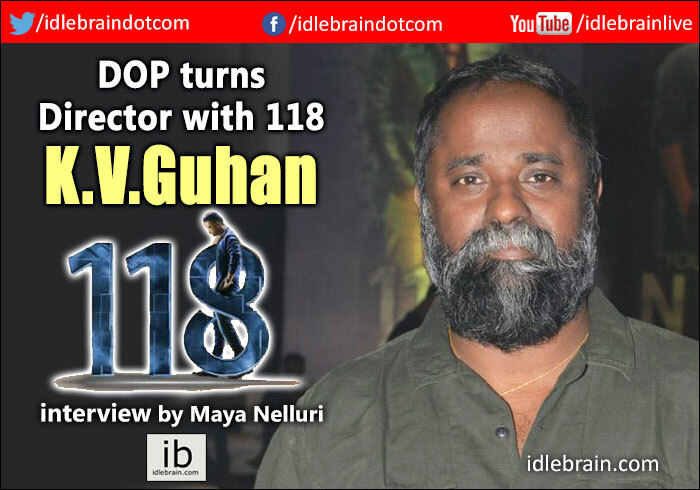 Guhan turns director with this week’s release 118. The thriller has had a great reception from Nandamuri fans and looks to be telling a unique story. We dove into the mind of the man behind 118 to get you the latest insights about his life and the film. What made you shift domains from cinematography to direction? Eventually all of us with a passion for films want to end up here. Direction is the ultimate destination we want to get to and touch. With photography there comes a time where you get exhausted and you want to do more, find out more! It is passion driven. When I was young I randomly took up photography. But when I started assisting PC sir I realised my passion is the whole of filmmaking. Whenever I work as a cinematographer also I’m involved with multiple aspects of the process, more like a co-director. I’m more interested in how to tell the story, how to make a film. I also used to work on stories during my time off but then it would get stalled when my cinematography work started. Ten years ago in 2008 I directed the Tamil version of Happy Days for Prakash Raj films. It was very well appreciated. The script of the film was however very soft; it is not my taste. I decided I should do my next project according to my taste. I like investigative and Godfather type of films. Moreover as a director, entertainment is not so easy to bring out. Any love story or comedy is tough to make while holding the audience’s interest. Over the years I’ve become a serious person so I felt that a thriller will be easier for me handle. I’m a very big fan of the Godfather and Rocky series among other classics. I have my own collection of films in my locker which I take out every six months to watch and get inspired by. I also keep updated with the current lot of films because I don’t want to miss out on what’s currently happening in the industry. Tell us about your life before films. I joined films in my early years. I did my Diploma in Mechanical Engineering and immediately joined K. Balachandar sir’s company even before receiving my certificate. My brother was an assistant there at the time. There I spent four years in editing. Since I was just out of college I didn’t know how to behave also; it was a lot of fun! Actually to be precise it was only after I joined Balachandar sir’s company that I met a lot of people from the Pune Institute; they changed my point of view and made me look deeper into filmmaking. Post that I was with PC sir for six years. When you work for him you are forced to move on from adolescence to adulthood. The Hindi film Kushi was my first break. How was your experience as a cinematographer? I got lucky to have worked alongside directors like Trivikram, Srinu Vaitla, Tamil director Radha Mohan. They all had varied tastes so I got to learn something from each of them. During directing it was very helpful. All their influences can be seen in my work. Did being a cinematographer help while directing? It helped a lot. Having been a cinematographer for so many years work happened naturally. My experience became second nature and the quality of my work became a part of me. Generally when cinematographers turn directors they tend to get carried away by cinematography. When I was doing 118 I ensured that the photography reaches a certain quality which is a part of me but did not experiment as a DOP or go overboard; this film also didn’t demand that so it made things easier. All that helped me while discussing the film as a director and making sure the scenes are coming out well. Why did you choose 118 as your directorial debut in Telugu? And why with Kalyan Ram? As I mentioned I’ve been working on different scripts over the years but kept getting stuck when I would stop and then work on some other project as a DOP. Over a year later when I would get done with the film and I looked back at the script, my work seemed immature because it was about a year old by then. With 118, there was an experience in my life and I thought why not make it into a film. One day while travelling to some other city, the whole idea came to me. I wrote all the points from beginning to end immediately. After that the gaps were filled in during discussions and writings; and the dots were connected. I was doing clash work for PC sir for Kalyan Ram’s film Na Nuvvu. Every morning whenever I came to the set me and Kalyan Ram used to sit and talk about our passions. I told him I have an idea for a film and he was interested in hearing out different ideas. Everyone says they are interested but nothing comes of it so I was wary at first but he followed up himself and asked me to narrate. I gave him a 2.5 hour narration. I myself was surprised because I didn’t know if I could manage a full narration, but I did really well. He really liked the script. Within a week from that day the project was confirmed. And within ten days after that discussions started. In fact the shoot date was also fixed within two months from it. I feel that the idea pulled itself into existence. Somehow no one could say no to it. I told Nivetha, Shalini, the editor, everyone immediately got hooked and wanted to be a part of 118. Good content always takes care of its own selling. How are you expecting the audience to react to 118? I am confident that it will be well appreciated. There are a lot of changes in all the industries of late. New scripts are coming out. Even Telugu audiences are not reverting to templates anymore. If my film can be a stone among those change-makers, if I’m there, I’ll be proud. I also feel that the overseas market will also easily get connected to it. This script has a unique feature which makes everyone feel like they had similar experiences. Going forward will you be concentrating on direction? I was smitten! When I was a cinematographer, I felt my talent’s usefulness is constrained to only one level of filmmaking. In direction I have to sit down with every department – music, edit; wherever you are your brain is always active and constantly thinking. It got me more occupied and exploring a lot more. As for my next script I want to do a different genre but reach everyone. I don’t want to make ideas that don’t connect to people but at the same time they should be unique.